Are We Who We Were? Throughout the 21st Century, our world (at least for those of us inside the NAU) has become increasingly connected. So much so that we really are now thinking as a single fluid organism, changing not just how we live our daily lives, but who we are as a species. In Sterling Gibson's newest thoughtful exploration, one of the NAU's most renowned thinkers explores and illuminates how hyperconnectivity and The Beam have changed us forever. 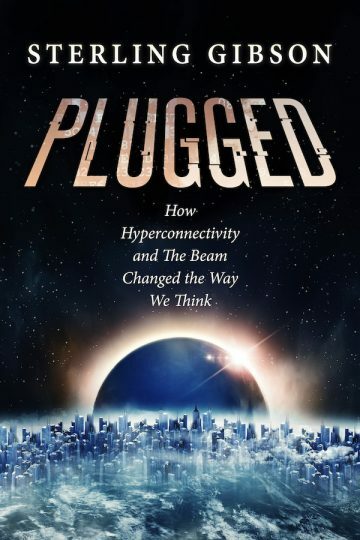 Plugged is a “nonfiction written as fiction” book in the world of the sci-fi series The Beam. It's available exclusively to newsletter subscribers. Click here or the button to the left to download from BookFunnel! What happened during the years of The Fall, when the world basically declared war on humanity? How did the Wild East (everything outside the NAU) became so wild? How did Crossbrace become the Internet … and in turn, how did Crossbrace become the fundamentally different, entirely revolutionary network known as The Beam?